For many people, camping is a time to escape every day life and spend some quality time in nature. Far away from email alerts and push notifications. For others, technology has enabled them to go further into the woods thanks to navigational tools or even the ability to work remotely from distant campsites. No matter where you fall on the spectrum of outdoor pursuits, one thing is clear—more of our gear than ever before is powered by electricity. People use cell phones as cameras, LED lanterns to replace unwieldy and environmentally-harmful kerosene, carry backpacks with speakers, and GPS devices to find their way or keep track of hunting dogs. Everything seems to have a plug, even when you head off-grid to unplug. For that reason, portable power supplies for camping are one of the most popular new accessories for a weekend in the woods. With the recent emergence of this technology and the ever-improving battery packs that make chargers lighter, smaller, and more powerful, it’s time to look at four of the best options currently available. The Suaoki Portable Power Station is the most portable device with the highest overall reviews and most thoughtful touches for the price. It offers features not found in power supplies that cost twice as much and offers a reasonable tradeoff between power delivery, size, and weight which makes it the best choice for the most consumers. It has a battery management system to meter the amount of power delivered at any given time; the system also monitors the amount of power remaining in the device, which is displayed via a built-in display that is easy-to-read and illuminated. The battery management system also intelligently splits power draw from the internal battery packs and solar panels when they are attached, which maximizes charging efficiency between devices and the Portable Power Station. The Power Station also features a built-in flashlight and a segment-leading 4 USB ports (including one USB 3.0 fast-charger for compatible smartphones and devices), 2 AC outlets, and 4 DC outlets for metering out power across devices. 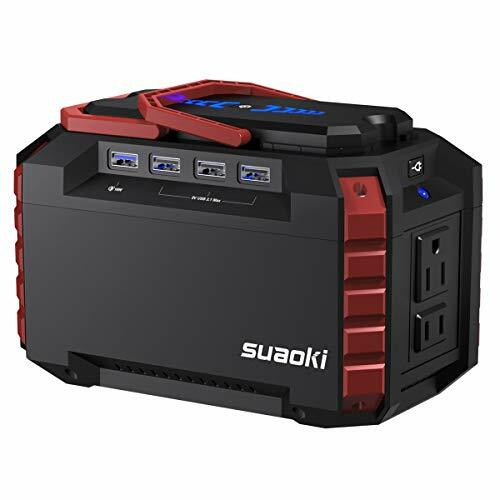 These thoughtful features, light weight (2.9 pounds), compact dimensions, and a plethora of favorable reviews on real-world functionality and durability make the Suaoki Portable Power Station the top pick for portable chargers. 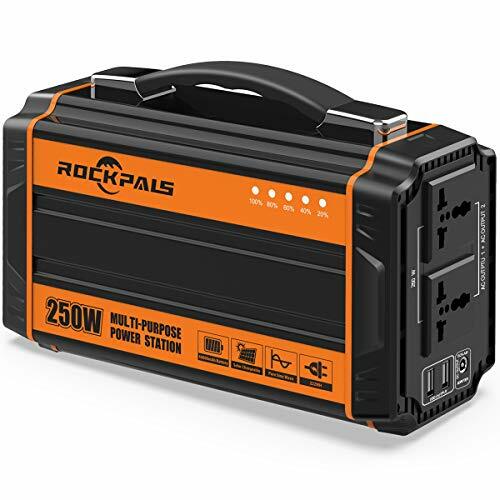 The Rockpals 250-Watt Generator is one of the most powerful devices for its size and is highly-rated for a variety of demanding uses. The device is advertised as suitable for CPAP devices which means it produces consistent pure sine wave electricity that can run many medical devices and other demanding and sensitive machines like sabre saws. While not many people consider the type of electrical waves delivered by a given device, for users or devices where it matters, this can be a critical difference between a ruined device or a medical emergency or a peaceful night’s sleep. The on-label use for CPAP machines means this device is safe for charging all portable electronics without worries of surging or inconsistent electrical waves. Its 250-watt continuous charge (with 300-watt safe surges for demanding devices) means it will charge multiple laptops and smartphones as quickly as a standard wall outlet. Its large lithium power pack holds 222WH (3.7V 60Ah/12V 18.5Ah) which will charge a smartphone from dead 25 times or a laptop 3-5 times. The entire power supply weighs 5.5 pounds and can be charged via a wall outlet in 8 hours; available solar panels make it possible to recharge the power supply while off-grid for extended periods. The pure sine wave inverter provides the same electrical current as utility-supplied electricity from a wall outlet, which makes induction-based devices like microwaves and power tools run smoother while reducing the risk of damage to devices while plugged in. 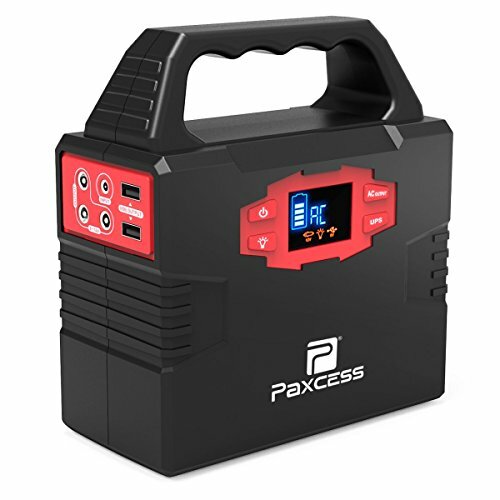 The Paxcess 100-Watt Portable Generator Power Station is the best portable power supply under $150. While its price is lower than some of the competition, it does not skimp on quality. The Paxcess 100-Watt features a lower overall power rating than the other listed devices, but its features list is competitive and it is favorably reviewed across use cases. 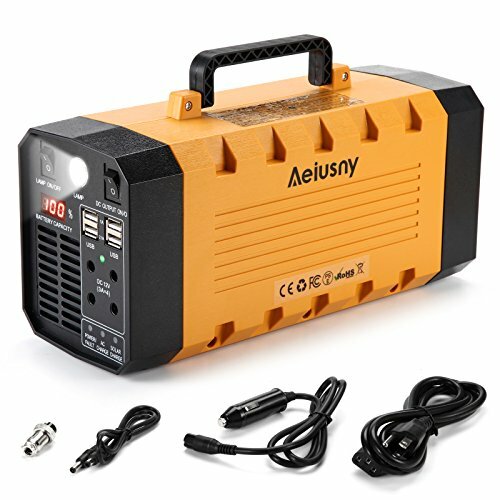 The 100-Watt constant (150-Watt surge) rated power supply is not powerful enough to run power tools, but it will charge cellphones, laptops, lanterns, and other off-grid essentials. Even with the smaller battery pack, the Paxcess will charge a smartphone 18 times on a single battery charge. It delivers modified sine wave power which is not suitable for more powerful devices, but CPAP users note 2-3 nights’ of power using the appropriate settings. The Paxcess is favored for its durability and portability at a competitive price. While it may not offer the power or features of more expensive products, its quality and ease-of-use are all that most portable power supply buyers will ever need. The Aeiusny Solar Portable Generator receives honorable mention because its spec list and price are overkill for most applications. The Aeiusny is the only 500-watt power pack on the list, which is twice the power of the Rockpals and five times the power of the Paxcess. With a surge power rating of 1000 watts, the Aeiusny can effortlessly power most devices that anyone could take with them on a camping or RV trip. With 4 USB ports, 4 DC ports, and 2 AC outlets, there are plenty of options for plugging in and running devices that smaller power packs simply cannot run (or will run for a very short time before being fully depleted). While the Aeiusny is large and not as portable as the competition, when you need to run larger devices or standard devices for a longer period of time (and have a good way to carry it), it is the best portable power pack in the 500-watt range. Large battery pack can charge smartphones up to 55 times or run a computer with zero battery for up to 8 hours of continuous use. What is the best portable power supply for me? This buyer’s guide evaluated four of the highest-rated portable power supplies on the market. Each has its own strengths and weaknesses, from size and portability to style and level of power deliver, to price vs. features. Determining which is best for you depends on a variety of factors, from budget to what you plan to plug into the power supply to where you plan on taking it. The specs of each power supply explain how much power it can deliver and how much it weighs, which are two of the largest considerations for a portable power pack. What are the best power supply brands? As you may have noticed, power supplies are made by different manufacturers than most other electronics and camping gear. The above options are highly-rated across popular consumer websites and boast specs that are competitive or top-of-class in their respective size and power tiers. What if I need less power or more portability? The four options listed here are some of the best power supplies for the most people. However, each manufacturer makes more sizes and power levels to fit more specific use cases. From highly-mobile backpacking power supplies to much larger and more powerful devices for emergency backup or long-term RV camping, there are options to fit your application! Using this buying guide, you can determine which features are most important to you before exploring your preferred manufacturer’s product lineup to find the right balance of power, size, and price to fit your needs. Whether you are running a tent heater to extend the camping season in to the winter months or are planning to camp at a more ‘urban’ setting like a music festival which requires multiple devices to stay charged in an otherwise off-grid environment, portable power packs are a useful addition to your gear cabinet for everything from a quick overnight trip to a longer romp in the woods. For many people, the prospect of not having electricity is one of the biggest barriers to entry for camping. And for those who are committed to ‘unplugging’ when they go into the woods, GPS devices and cameras still require power. For the simple overnight trip or occasional need to charge your cellphone, something like the affordable Paxcess or comparison winning Suaoki will meet all of your needs for charging and portability alike. If you are car camping at a festival or drive-in campsite, the larger Rockpals or Aeiusny chargers offer more power to run more amenities or recharge standard devices more times without returning to civilization for more wall power. In an era where technology is a fact of life, the ability to charge our devices is essential. Many wilderness area maps are now available in app form and smartphones offer us the ability to quickly capture unforgettable moments; simple rechargeable devices have lifesaving capability whether they are medical tools or GPS spot trackers. With the improvements in technology in recent years, more rechargeable devices are campsite-ready and more portable power sources are available to charge those devices.